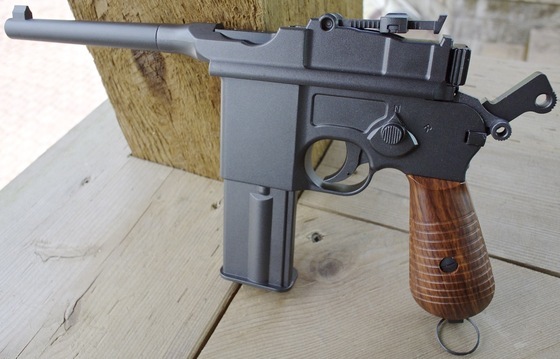 Trigger Pull: The Single Action Only trigger pull on the KWC Mauser CO2 Blowback Airsoft Pistol is what you would expect from a full blowback, true single action only pistol, it has a little bit of take-up and then a smooth fairly light release. Of course when in full auto mode, just press and hold the trigger till the ammo is gone, but don't hold the trigger too long since when the BB's run out, the gun will keep firing as there is no bolt lock back on empty. Accuracy: It took me a while to figure out exactly where this pistol was actually shooting, but once I realized the KWC Mauser was shooting way high and I adjusted the rear sight all the way to the bottom, I started getting shots at least on to the paper, I did have to hold really low to get near the bulls eye but keep in mind this is a sample pre-production model so some modifications may be in order to correct the rather high shot placement. Over all the accuracy at 30 feet out was very good with about a 2 inch group from 10 shots. Full auto was as you would expect, more of a spray and pray. I do have to say I was surprised by the feet per second performance, even with .25 gram Airsoft BB's I still shot well over 400 fps on a new CO2 cartridge. 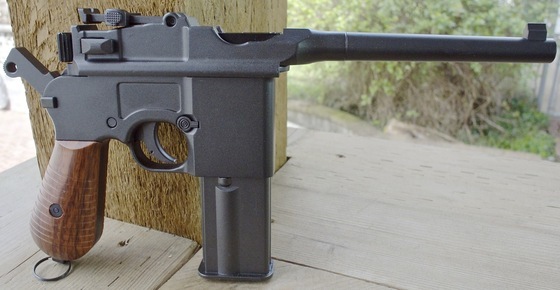 Build Quality: The KWC Mauser CO2 Blowback Airsoft Pistol is well built being that it is pretty much entirely metal. 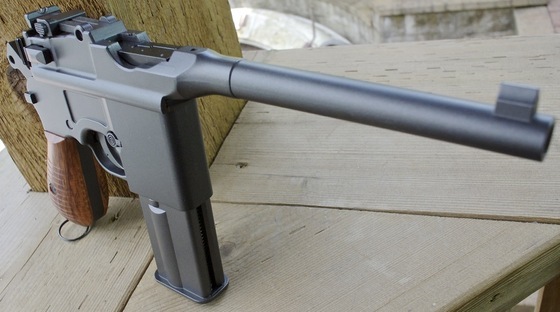 It weighs in at a whopping 3.15 pounds so be prepared for a heavier gun but you can choose to hold it two handed by using the forward magazine as a sort of fore-grip. Again this was a pre-production sample but even so the fit and finish looked and felt good. I really liked the dark grey finish and very believable plastic wood grain grips. Realism: The KWC Mauser Airsoft Pistol is spot on replica of the M1932 / M712 Schnellfeuer with as far as I can tell all the same working parts including the semi and full auto selector switch. The KWC Mauser also has a full working bolt, hammer, safety, adjustable rear sight and of course full size drop out metal magazine that holds the CO2 and Airsoft BB's. Very high fps and good accuracy. Very good replica of a real Mauser (M1932 / M712 Schnellfeuer) with all working parts. Nice short single action light trigger. Shoots in both semi and full auto selectable. Will come in 4.5mm Steel BB and 6mm Plastic Airsoft. Bolt does not lock back on last shot. Seemed to shoot really high even when adjusted as low as possible. Not totally sure when we will have it in stock? Overall the KWC Mauser CO2 Blowback Airsoft Pistol is that all metal version we kind of hoped Umarex had made, and from what I can tell in the KWC product brochure, this one should be available in both 4.5mm Steel BB and 6mm Plastic Airsoft so this should make everyone pretty happy :) Other than the rather high shot placement I really liked the KWC Mauser especially the super high fps and ultra fast rate of fire in full auto mode. Another must have classic war pistol to add to the collection!